Wonderful staff, friendly and always willing to assist. 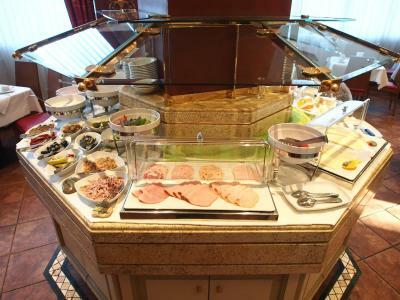 The breakfast buffet had many options and good quality food. The location was very convenient for our business meetings nearby. A couple of very good restaurant options within a 20-25 minute walk from the hotel. Easy access to the bus and U-Bahn. The staff was quite friendly and helpful. They quickly resolved and issue with one of our rooms. The location made for easy access to the public transit (bus and tram). There are several shops and restaurants nearby, unfortunately we weren’t able to explore because the shops are closed on Sundays. Wonderful breakfasts, nice friendly staff. Nice design at reception and restaurant. Enjoyed the included bkfst. Front desk staff very nice and helpful. 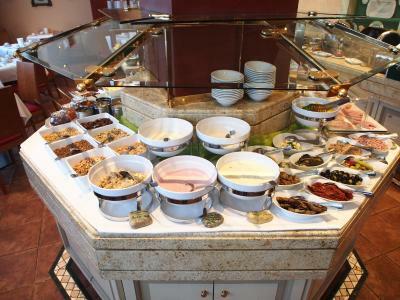 The breakfast was really great, tasty and lots of choice! Feringapark Hotel This rating is a reflection of how the property compares to the industry standard when it comes to price, facilities and services available. It's based on a self-evaluation by the property. Use this rating to help choose your stay! This privately run hotel offers elegant accommodations in Munich's Unterföhring district, on the north-eastern outskirts of the Englischer Garten park. The A9 motorway is just 1.2 miles away. Featuring a classical décor, the hotel's Feringa Stuben restaurant will treat you to Bavarian specialties and international creations. Hearty Bavarian dishes await you in the traditional Bräustüberl lounge. Unwind with a drink in the hotel bar or Feringa Lounge with terrace. 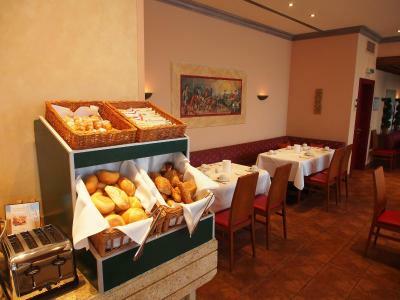 Unterfohring is a great choice for travelers interested in local food, restaurants and atmosphere. When would you like to stay at Feringapark Hotel? These spacious, well-equipped rooms offer a modern desk and cozy sitting area. These non-smoking rooms offer air conditioning and a flat-screen TV. House Rules Feringapark Hotel takes special requests – add in the next step! Feringapark Hotel accepts these cards and reserves the right to temporarily hold an amount prior to arrival. The garage was confusing because of a other company beeing in the same building using the same garage. Good connection with Tram no.16 to City centre. Far from center munich. Very expensive to go and return to the downtown with taxi. No coffee/tea in room. Had to request ironing board and iron and share with other guests. Internet kept dropping out, sometimes within 30 mins and had to go through login process constantly. Continued heatwave this summer made for warm conditions and my room was not air-conditioned. The front desk staff gladly provided a floor fan which made it much more comfortable for sleeping. I noticed the shower water temperature fluctuated from warm to hot sporadically for some reason. The desk staff put me with another guest for a taxi. I told him it's different address of exhibitions but he insisted it's walking distance. However, it's total different directions and cost me double with Euro 50 and 1 hour to my destination (original Euro 23 and 25 minutes). The room is not deserved 4 stars.